The UW Polish Studies Endowment Committee presents a lecture by Dr. Tomasz Pudlocki entitled Household and Gender Roles in 19th Century Central Europe. Dr. Pudlocki works at the History Dept of the Jagiellonian Univ. in Cracow, and in 2012 / 2013 is visiting with the Columbia University. The lecture discusses gender role aspects for different social classes. According to the old Polish tradition, Andrzejki (a party on St. Andrew’s night, Nov 30) was the last big party of the year, with some special customs such as divining future from pouring hot wax on water. Music from CD. Additional attractions: a performance by a guitar trio and a dance show by U.S. Ballroom Champions. Doors open at 6 pm with dinner available at the Polish Home restaurant downstairs till 10 pm, bar opens at 7:30 pm, dancing from 9 pm to 1 am. Where: at the Polish Cultural Center / Polish Home, tickets $15 PHA members and $20 for non-members. Babysitting available at the conference room from 7 pm to midnight. 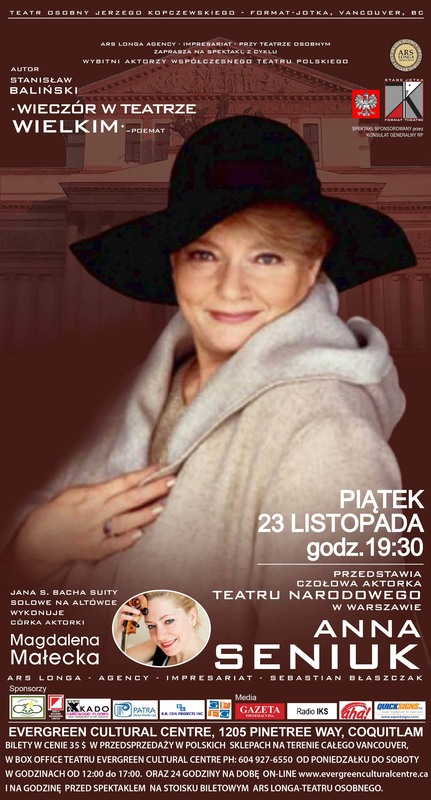 Polish Home Association presents a monodrama in Polish Wieczor w Teatrze Wielkim based on a poem by Stanislaw Balinski starring Anna Seniuk. The play is an homage to theatre and artists of pre-WWII era. Ms. Seniuk is an actress from Teatr Narodowy in Warsaw, known from movies and a popular TV soap opera 40-latek. The program includes suites by J. S. Bach played on viola by Magdalena Malecka. More: Anna Seniuk bio (PL), there is also a performance in Vancouver, BC on Nov 23, 2012. The book for the meeting is Droga Pani Schubert by Ewa Lipska published by Wydawnictwo Literackie in 2012. Ms. Lipska is a contemporary poetess and the book is her latest volume of poems written in form of poetic letters. The Young Polanie, the children's Polish folk dancing and theatrical group was formed at the Polish Home In Seattle in 1967. The group invites all the past members, performers, with their spouses and families to a banquet celebrating the 45th anniversary. Where: at the Polish Cultural Center / Polish Home in Seattle; tickets $20 - this event is sold out. More: for reservations please contact Anna Borodenko or Pawel Kulik. 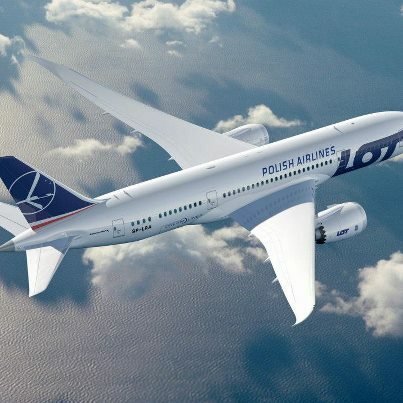 Polish Airlines LOT receive the long awaited Boeing 787 delivery in November. This is also the first Dreamliner delivery to Europe. The delivery ceremony is scheduled for Nov 14 with Polish Deputy Minister of Foreign Affairs Hon. Beata Stelmach and the Ambassador of Poland to the United States, Hon. Ryszard Schnepf attending. LOT has outstanding orders for seven more Dreamliners. Update: video from the Paine Field ceremony and send off. Where: Paine Field, Everett, WA. By invitation only. Polish Home Association presents a performance in Polish Fantazja, Witkacowski Salon Artystyczny by the Witkacy Theatre from Zakopane, Poland. The Theatre is visiting Seattle in relation to the Boeing 787 delivery to the Polish Airlines LOT. Witkacy is an artistic alias for Stanislaw Ignacy "Witkacy" Witkiewicz (1885-1939), who was a very well known Polish painter, novelist and playwright before WWII. Frank Piasecki (1920-2008) was an aviation pioneer and the inventor of the dual motor helicopter known as the flying banana. The Museum of Fight presents an exhibition about Polish aviation engineers and inventors originally created by the Polish Aviation Museum in Cracow. The opening night program includes a welcome ceremony with Polish Deputy Minister of Foreign Affairs Beata Stelmach and the Ambassador of Poland to the United States Ryszard Schnepf, a theatre performance and a reception. Polish Library Building Association in Portland invites to a performance in Polish Linie rownolegle by the Witkacy Theatre from Zakopane. The program is a collage of songs by the most famous cabaret masters from 1920s & 1930s, such as Tuwim or Slonimski. The show is an arts salon a la Witkacy taking you on a sentimental journey through history of Polish theatre. A dinner will follow the performance at 6:30 pm. Seattle-Gdynia Sister City Association invites everybody to a presentation celebrating the Polish Independence Day of November 11 by Cpt. Anthony Haapasaari-Olpinski, USAR (ret.). Cpt. Haapasaari-Olpinski's passion is Polish military history and traditions. The presentation will focus on the history of the Independence Day and some related military traditions. UW Jackson School of International Studies invites to a lecture and reception remembering Prof. H. Ellison, entitled From Great Expectations to Humdrum Reality: Easter Europe Disappointment with Post- Communism by Prof. Daniel Chirot. The lecture discusses aftermath of the 1989 revolutions in Eastern Europe. Dr. Chirot is a UW Professor of International Studies. The annual fall bazaar features booths with Polish books and CDs, crafts, pottery, crystal, amber etc. as well as booths by local Polish-American organizations. Polish Choir Vivat Musica is expected to perform. You can buy Christmas ornaments and wafers (oplatki), Polish pierogi, home made cakes and enjoy a full course dinner. Also, frozen pierogi from Chicago to go. Organized by the Ladies Auxiliary. Where: at the Polish Cultural Center / Polish Home, admission free.